Syrah is a popular red wine grape that’s delicious on its own and perfect as a blending grape. Grenache is typically blended with Syrah and vice versa, although Grenache usually needs more Syrah than Syrah needs Grenache. Syrahs, compared to Grenache, boast color, tannin, acid and darker fruits. You’ll find some of the best Syrahs in Northern Rhone’s moderate climate with steep rocks. The climate and soil produce powerful, complex and age-worthy wines. You’ll also find boast-worthy Syrah in Southern Rhone’s hot climate with flatter terrain. Want an expensive Syrah? Go for a Cru of Chateauneuf-du-Pape. Shiraz, in Australia, found in the Barossa Valley, Hunter Valley and Mclaren Vale. Here you’ll get a fuller body Syrah with softer tannins and less acidity. You’ll find intense black fruit, sweet spice and chocolate notes. Oak aging will produce smoke, vanilla and coconut aromas. Syrah, or Shiraz in Australia is a deeply colored red grape that produces dark ruby to purple wines. 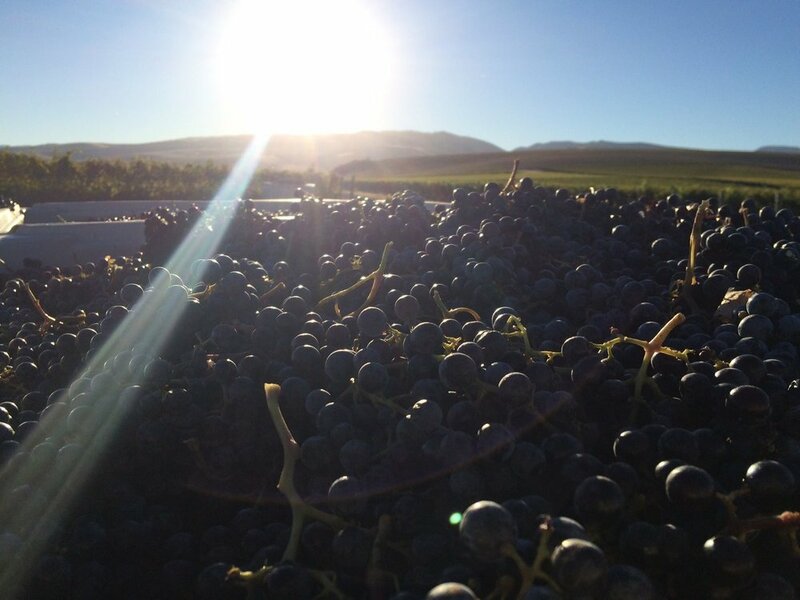 It’s best grown in a moderate or hot climate, making Eastern Washington a perfect climate to source our Syrah grapes from! 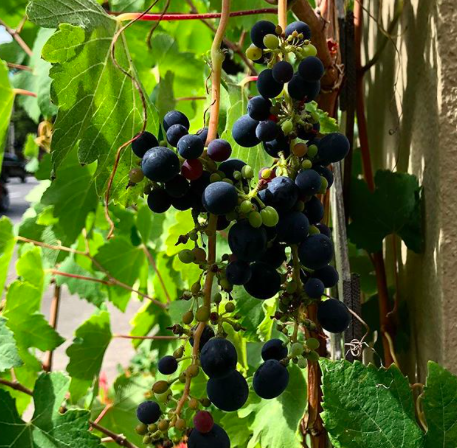 Syrah is a thick-skinned grape that can survive the hot summers and cool nights/winters that Eastern Washington experiences. Washington’s most popular grape varieties are Cabernet Sauvignon, Merlot and Syrah. It’s no wonder we love making wines from these three varietals! Syrah is typically listed last in our tasting menu. We do this on purpose, because Syrah is typically a medium-full bodied wine with medium acidity and medium-high tannins. Syrah’s can coat your mouth and sometimes produces a heavy, earthy, and smokey feel that rounds out a tasting perfectly. In a moderate climate, your Syrah will taste herbaceous, gamy, spicy, and boast black fruits. Hot climate Syrah’s still have black fruits, but taste of chocolate and sweet spice. Over time as Syrah ages, you’ll taste leather. So what type of Syrah do we make? Our 2015 Coyote Canyon, a favorite among customers is made from 100% Coyote Canyon Syrah. On the nose you’ll get chocolate, blueberry and dark fruits and on the palate you may even get some funky, earthy notes! This Syrah was aged for 22 months in French Oak. Our 2016 Columbia Valley Syrah made from 48% Coyote Canyon Syrah, 32% Les Collines Vineyard Syrah and 20% Stoney Vine Vineyard Syrah has notes of cocoa powder and raspberry, while on the palate is full of campfire smokiness and tobacco. Our 2016 Walla Walla Syrah, 100% Syrah from Stoney Vines in Walla Walla and Oregon has herbaceous notes of dried parsely, dark fruit and cedar on the nose. This one gets a little funkier with blue cheese, mushrooms and cedar on the palate. Overall, our Syrah’s are deep, rich, lucious, earthy, spicy and funky. Eastern Washington helps us accomplish this due to the ideal growing conditions. Enjoy our current Syrah selection while it lasts! We only have 2 more cases left of our 2015 Coyote Canyon Syrah. Cheers!